In which we talk about the jerks who don’t know how to give constructive criticism. When you’re dealing with people, I don’t give a damn whether you’ve got an MBA or a GED. You know what matters to me? How you TREAT people. Yes, how you treat me is a significant factor, but I also look at how you treat others. How you talk about others. What you write in e-mail. Everything you say to or about people shows me the kind of person that you are. And if you’re being a douche nozzle, you should probably take this to heart. I didn’t attend a fancy business school, but I did learn that the best way to deliver criticism is with a spoonful of sugar. Mary Poppins is my homie. If you’re going to tell a writer that their work could use a little cleaning up, I recommend the compliment sandwich. Someone to check your grammar and spelling (this is optional but highly recommended if you’re sending criticism via e-mail). Step 1: Whether you’re writing an e-mail or confronting the offender in person, it’s best to ensure that you know exactly what you’re going to say. Words are powerful. If you’re not sure of your phrasing, consult with other people. This is essential. Step 5: Offer that solution. If you genuinely don’t have a solution, give them TIME to come up with a solution. If you couldn’t think of one in the time it took you to plan this, they certainly aren’t going to have a solution on the spot, especially if they’re feeling attacked. Step 6: Bring it right back to another compliment. Positive reinforcement works wonders. The whip? Not so much. “Thank you.” “I know you can do this.” “You’ve got a lot of great ideas, let’s implement them.” If you can’t think of 2 compliments, you’ve got a whole different problem on your hands, and I can’t help you. But if you can, then be nice to your people. Duh? You have so much potential, so I know that you CAN make this compliment sandwich thing work. Have you experienced a peer or someone in your place of employment who didn’t have a nice thing to say, ever? How did you handle it? 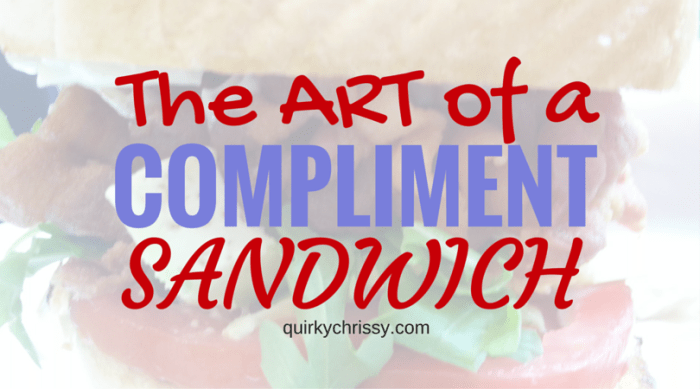 Do you believe in the compliment sandwich? How do you deliver constructive criticism?